You’re a smart, health-conscious guy who stocks his fridge with good stuff: veggies, lean protein, berries—all the basics for building the ripped body you want. But when you’re on a road trip with the boys or joining the fam for Grandma’s birthday dinner, you don’t always get to pick the place. Instead, you’re left with chain restaurant menu options, many of which don’t gel with what you’d normally eat to stay in shape. “You never know what could be in the meal you choose,” says Keri Gans, R.D., author of The Small-Change Diet. “Be aware that just because it sounds healthy doesn’t mean it’s the healthy choice.” Need an example? We’ve taken a look at seven over-the-top fast-food entrées and provided a healthier alternative to each. Chicken and avocado: the perfect marriage of protein and heart-healthy omega-3 fats. Problem is, blue cheese dressing turns this sandwich into a heavyweight. The Classic Chicken Salad Sandwich, even though it’s made with mayo, will still help you save more than 200 calories and 14g of fat. When you’re grilling them at home, veggie-heavy fajitas make a superlean, nutrient-packed dinner. But at a restaurant, “sizzling” translates to loads of oil and/or butter. Tilapia is a better call here; it’s grilled and not swimming in sauce. Plus, you get a slew of veggies on the side. You made the choice to forgo an overstuffed burrito and didn’t order chips on the side. Great start, but hold up: Skipping a shell won’t save you calories and fat if you load your lettuce with heaps of cheese and a colossal scoop of guac. A smarter strategy for ordering Tex-Mex takeout: Use Chipotle’s online nutrition calculator, advises Gans. 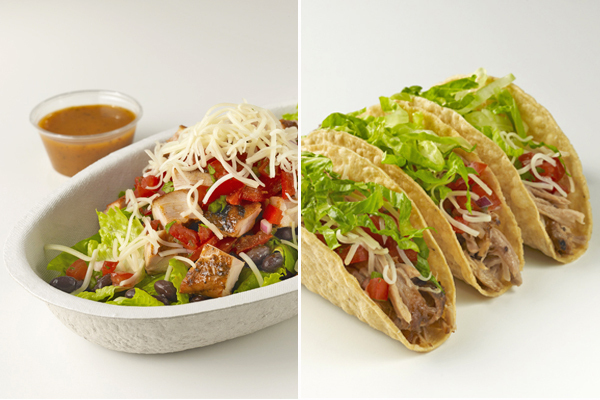 Pick your base—burrito, bowl, tacos, or salad—plus protein and toppings, and see where your meal weighs in before you step up to order. Skipping the Quarter Pounder with Cheese and ordering the chicken sandwich—smart move, right? Not so fast. This beast actually has more calories and fat than a Big Mac. The fried patty—along with the bacon, cheese, and mayo it’s topped with—are practically dripping with saturated fat and contain 1,410mg of sodium, more than half of what a guy needs in a day. Too much sodium can lead to bloating, says Gans, so the hard work you did in the gym this morning won’t even have a chance to show up. But going for chicken is still a good instinct when you’re at the Golden Arches. Just make sure it’s grilled and doesn’t come with a lot of fatty extras. The Premium McWrap Chicken Sweet Chicken Chili (Grilled) has 400 fewer mg of sodium, plus it’s stuffed with filling veggies such as cucumbers and spring greens. “And it still provides 26g of protein, which is plenty,” notes Gans. Grilled chicken is a great go-to muscle food, but watch out for sweet-tasting sauces. This miso-glazed entrée is the perfect example of how sugar can crank up the calories in an otherwise healthy source of protein. Go for the Dragonfire Chicken instead—its sauce is spicy, not sweet, and pineapple pico de gallo and mandarin oranges add natural flavor to the dish. 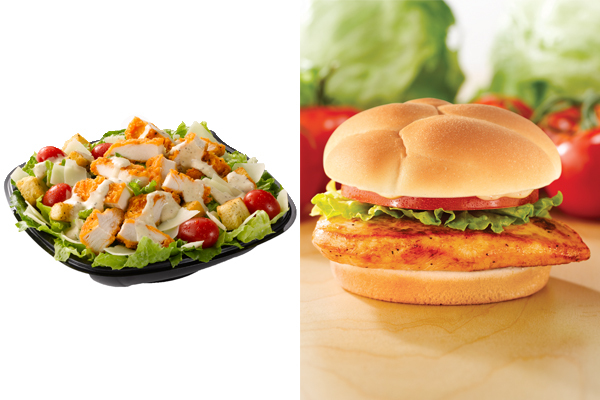 Wendy’s is another spot where you might be better off skipping salad. Creamy lemon-garlic dressing, Asiago cheese, breaded chicken, and oil-soaked croutons do a number on an innocent bed of lettuce. Instead, grab a grilled chicken sandwich and you’ll cut calories in half and take in a fifth of the fat. Peanut butter is the ultimate post-gym snack, but when it’s done up like dessert—as in, blended with frozen yogurt and chocolate—you might as well stop for a milkshake on your way home. But order Jamba’s Protein Berry Workout Smoothie, made with muscle-building whey protein, and you’ll save almost 500 calories and avoid the fat entirely.